Agree. Too flat for Buller. I'm keen to give it a crack before winter, looks full on. They did it over 3 days. Considering im about 30mins behind them on a lap around Lysterfield I felt I needed more training before I gave it a go. Not staying at Buller per se but the Accor place in Merrijig so probably a mix of hiking and maybe MTB, plus wineries in the area if there are any. Chilling out too. Accor is now the sebel. Good luck!! Reviews sound OK, except for the restaurant. We shall see. You may be right. She did go on a school trip to Charlotte's Pass in 1937 or 1938, but she told me that she hadn't taken well to skiing on that occasion and had spent her time wandering around admiring the scenery. She was only 12 or 13 at the time and this photo looked like an older version of her, but skiwear and glasses can be deceiving, so maybe this was the one time she gave it a go on that occasion. I've also looked up ski wear fashions, and her attire,and those of the other skiers does look more 30's than 50's. 50's fashions had the very narrow legged ski pant, while 30's, they were all baggy like this. 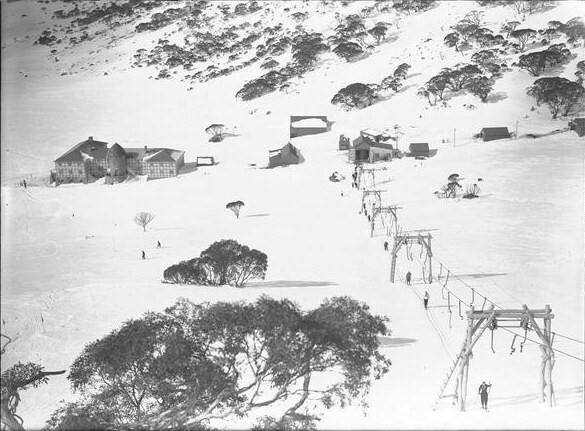 I've sent it to the Thredbo and NSW ski historical Society to see what they say. Hi everyone.It's been identified as "The Meat Hook" Charlotte's Pass, winter 1938. Apparently that was the first successful mechanical lift in Australia and this was it's first season. I guess that's why a whole lot of Melbourne girls went all the way over there. Wow! I have to say my memory with Charlotte Pass is pretty good for just one day visit. I think I recognised the mountain in the background as the one behind the village. 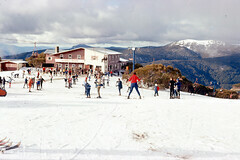 The current Kosi Hotel (the castle as I call it) would be to the skier's right of your mum (left of photo viewer.) I'm trying to find the photos from my gallery that match the direction. This is a photo of the Meat hook I found on Wikiski. The lift shed is a different colour in this pic from my photo, but the rest of the buildings are recognisable. djam, Dos, Whiteman and 1 other person like this. Dos and Marion like this. For some reason, when someone mentioned this photo wasn't at Buller, looking closely the peaks triggered my memory of Charlotte Pass. DbSki and Marion like this. Yes, you can see from this photo that it's Charlotte's Pass. Very well remembered. Well after finding out that the last photo was Charlotte's Pass,there's no doubting that this one is actually Buller. Not sure of the year. Early to mid 1960's I presume.The double chair might be a clue.That's my Mum's back centre stage in the red top and blue pants. You may have seen this shot. I did share it with the Alpine Museum up there in 2007. For some reason this photo is small on this site. If you want more detail, it's on my elbajc Flickr site. It's nice and big there. On the photopage choose share - a swooshy arrow icon bottom right. Chose the size you want. 500 or 640 are pretty good. Click on BB Code. Copy the code in the box (it will probably already be highlighted) and paste it straight into the text box here. Do not use the picture icon as that stuff is already coded by flickr. Think it is in the midst of a full blown renovation at the moment, would be interested to hear your thoughts after you get back. Dropped some supplies to the mountain and found a couple of images that might be of interest. This is a resort map - can anyone guess the year?? mx_boarder, CarveMan and Vermillion like this. Did I really post that? I wonder who it is. July 1981. Same as trail maps posted just now. Edgecrusher and Draizuh like this. An improved version. Interesting. Blue and Orange. Why you would ever get rid of poma's is beyond me. 1.8km summit access poma seems like it would sort the men from the boys!! Way faster than a fixed grip chair, down under the wind, great lifts. They're still everywhere in France. Mufts, Vermillion, Rimey and 2 others like this. Yeah i know i loved them, I did a season in L'Alpe D'Huez and the play is bloody covered in them. The duplex one up the Le Signal was a lot faster than the fixed 4! Jellybeans1000, NewTurns and LiveToSki like this. Think how much snow in a couple of days. That is the measure of a great Oz ski season. I arrived Day 56, left Day 60. See below. Had a great time, at the old old Melb Uni lodge, not far from the Roota. I mean, Kooroora. hazy memory, and on that image was the summit access poma two ways? One line lifting both out of Howqua and out of Bourke? So you never actually rode the 1.8k? 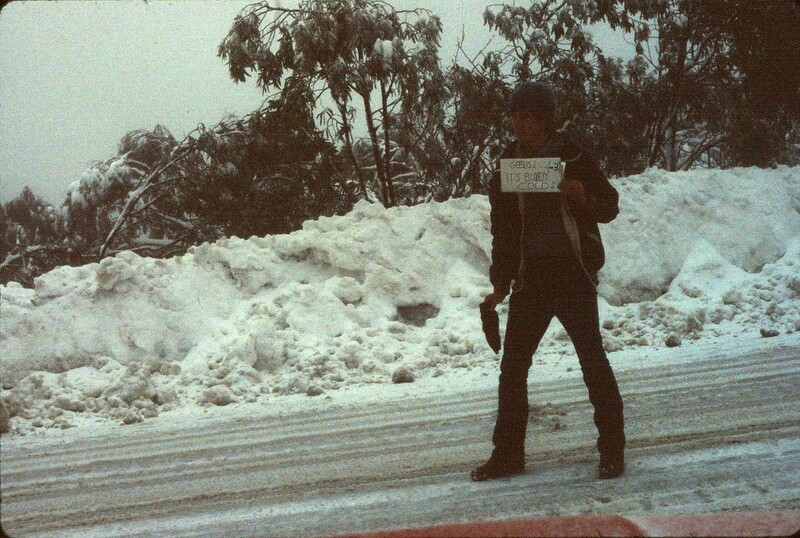 The old early photos in this thread just remind me of a mountain full of serious moguls.... have not skiied Buller for 25 years. Is it still a mogul minefield or has modern grooming tamed Federation and Bull Run? I also remember skiing an icy Fanny's Finish with heart in mouth and 100% focus through a rocky tight top section. When the snow is on fantastic terrain variety. We still have moguls on Fed and Bull run, we like that kind at Buller. NewTurns and CarveMan like this. Coming back the other way you would get of the other side of the hill and let go. Sometimes if you had grease on the base from the poma load station or it was snot and skis not gliding you could hang on to the Poma and ride it back to the A frame to save pushing your way down Baldy using poles, "A" frame was at the top of where Bk St slope begins at the bend where Baldy 1 and 2 kinked to the right to head up Baldy. 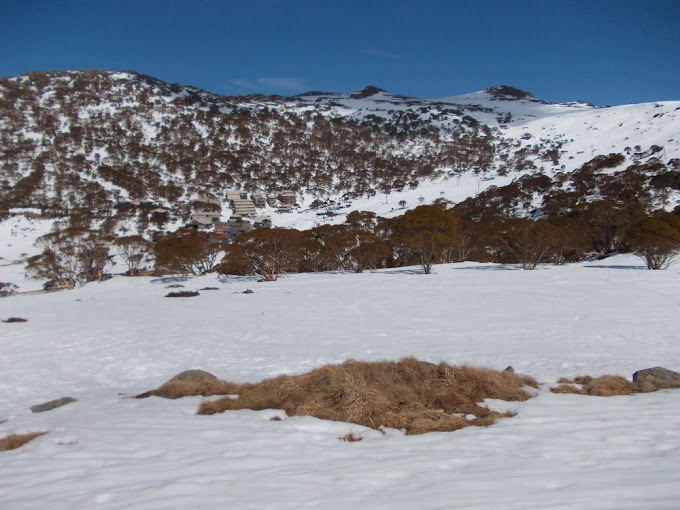 Grooming has ruined most of the Oz resorts but Buller's goods remain unmolested. Sorry Draizuh, what I meant was it was like 2 lifts, no one rode 1.8k at once as it ran up and then down. You didn't miss much, it was very scary as a kid. You approach as the 'ghost' pomas careered silently down the hill then screamed around the chain wire and slammed into the stationary poma waiting. You started on the most right hand slowest and worked up the courage to advance across a poma each time with the end goal being the Summit Access Poma. The first time I rode it, it felt like once the guy pulled the cable you flew about 10 feet before hitting snow. As I was small and too light, where it flattened out at the A-Frame, I would first slide directly under the fixed grip then get lifted airborne without the weight to extend the spring. As onlookers screamed to get off, I'd just sit there hoping I'd rotate correctly so skis were pointing uphill on touch down. Still hold the record I believe as the fastest aussie lift? The smell of diesel still reminds me of the Buller pomas and the feeling of fear that the SAP gave to kids. Ahh i see what you are saying! yeah lifts like that just make sense to me for crossing ridges. I dont know if its still the case but Wombat was still diesel when i was there! Not just related to Buller, but the constant smell of diesel at the bottom of every lift reminded me of my early days. Howqua poma was the one you couldn't get lazy on operating it because it was so fast. Aside from having to pull empty hangars to send them back to Bk St.
At Bk St the problem was more the tracks got heavy undulations in them on a soft day and if you survived the take off the undulations were the next hazard to get past before you were safe. Page 5 & 6 of this thread has photos of the summit access poma: bourke st end , and near the summit end and a staff member riding the lift. It was powered by a tractor sitting in the shed at Bourke st. Speaking of power , does anyone have a photo of the A- Frame , that used to sit at the top of Little Baldy? 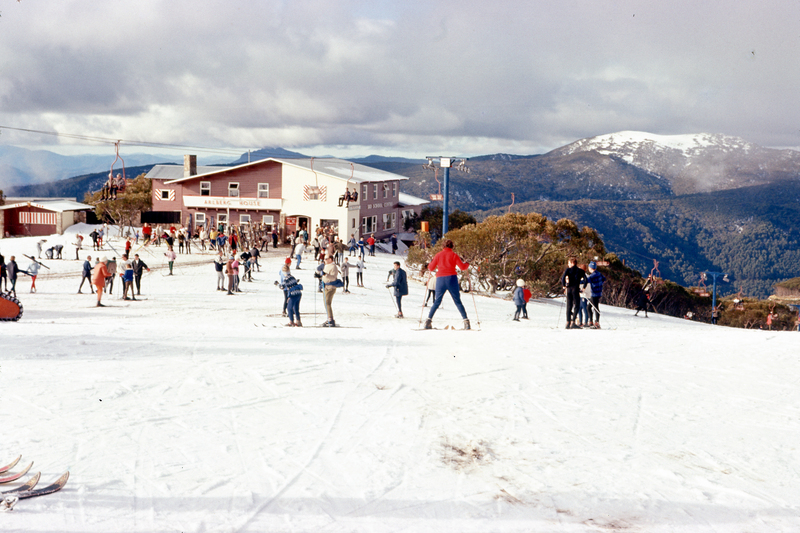 The A frame had been the top of a T- Bar in the 1960's. The T Bar ran down to Bourke St. It also housed a 1930's side valve Blackstone generator. That generator used to chug away at about 600 rpm , with a distinctive beat. Does anyone remember that as they rode past on the summit access poma? Black smoke coming out the exhaust. At that time, it was used to power the Federation T-bar which had an electric motor. It became redundant when the Fed Triple went in. Page 5 & 6 of this thread has photos of the summit access poma: bourke st end , and near the summit end and a staff member riding the lift. .
Yeah got a pic of A frame some place among fathers slides, it was Orange with white stripes as I recall and had a dirty black stain on it where an exhaust pipe stuck out the side. I know him as a local, mate of my mates. Saw him a few years back at a party with the crew. Jellybeans1000, miss_b_haven and DbSki like this. Whiteman, miss_b_haven and VSG like this.